The farm Sudersé is an organic arable farm and market garden. They have a Finnish loghouse and a shop where they sell all homegrown products, such as potatoes, vegetables, fruit and eggs. All these products can be ordered by internet as well. The farmer is happy to show you around the farm. Hot water and electricity comes from solar panels on the roof. The campsite is on the farmyard and has 32 large, sunny pitches, measuring from 100 till 200 square metres, suitable for tents as well as for caravans. From 2007 there is a field especially equiped for twenty camper vans. Sanitary facilities are good, new and heated the whole year through. For rent are two caravans and two hiker’s cabins. At the farm bicycles are for rent. For children child’s beds and highchairs are available; also there is a playground and there are small farm animals with wich they can enjoy themselves for sure. 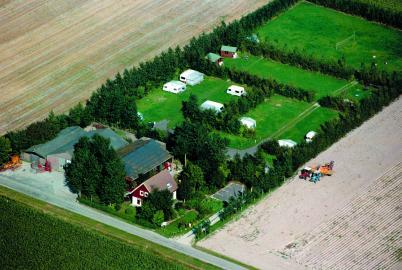 The campsite is situated between the old city of Workum and the IJsselmeer. Camping guests can enjoy the many water sport possiblities and also the many other ways of recreation by the waterside. The surroundings offer an amount of possibilities for trips to some of the Frisian towns, like Bolsward, Sneek, Hindeloopen and Stavoren, well known from the famous Dutch ice skating contest: ‘De Elf Steden-tocht’. Not far from the accommodation you find: in Exmorra the Frisian Agricultural Museum, in the village of Allingawier ‘De Izeren Kou’, which is a farmmuseum and the Jopie Huisman Museum in Workum. Also you can visit duck decoys. In August the famous Sneek week is held: a week full of sailing races and festivities.